Born from the principles of the local food movement, a growing number of people are returning to hunting and preparing fish and game for their home tables. Afield: A Chef's Guide to Preparing and Cooking Wild Game and Fish is at once a manifesto for this movement and a manual packed with everything the new hunter needs to know. Wild foods, when managed responsibly, are sustainable, ethical, and delicious, and author Jesse Griffiths combines traditional methods of hunting, butchering, and preparing fish and game with 85 mouthwatering recipes. Doves, Deer, Hogs, Squirrel, Rabbits, Ducks, Geese, Turkey, Flounder, White Bass, Crabs, Catfish, and more. Chef JESSE GRIFFITHS embodies the forefront of the new hunting-cooking movement. He has gained national praise for his strictly local butcher shop and supper clubs (Bon Appetit, Food & Wine, Country Living, Garden & Gun) and his series of practical hunting schools are the first of their kind. In less than a year, they have drawn students from around the country and have gained attention from The New York Times, Texas Monthly, and others. Jesse was nominated as Food & Wine's The People's Best New Chef in 2011, and is the owner and chef of Dai Due with his life/work partner, Tamara Mayfield. The couple received Austin's Local Hero award in 2010. JODY HORTON is an Austin-based food and lifestyle photographer. His work has appeared in Garden & Gun, Esquire, Food & Wine, Southern Living, Texas Monthly, and the New York Times. He is a frequent contributor to Texas Monthly, Garden & Gun, Edible Austin, and Southern Living. Find more of his work at www.jodyhorton.com. ANDREW ZIMMERN, regarded as one of the most versatile and knowledgeable personalities in the food world, is a James Beard Award-winning TV personality, chef, food writer, and teacher. He is the co-creator, host, and consulting producer of the Travel Channel's hit series Bizarre Foods with Andrew Zimmern. "Griffiths may be an ideologue, but his recipes adapt well to the work of the unarmed home cook hoping simply to feed friends beautiful, flavorful food in the chill of early winter. His anise brine mutes the wildness in feral boar. But it also augments the flavor of commercially raised pigs, increases the clarity of their flavor, acts as the best sort of kitchen cheat." "I don't really see myself plucking doves anytime soon—rather I tend to feed them—but I greatly admire Jesse Griffiths and his work, especially Afield. It's solid and real, not something stylish and trendy. It's clear that Jesse takes this work very seriously. That would be enough, but I have to add that the photographs are especially evocative." "After the Larousse Gastronomique, this book will become my new bible. Afield is part of the new generation of culinary books. Actually, it's more than just a culinary book, it's a North American chef d'oeuvre. Enjoy!" "A kindred spirit and fellow hunter, angler and cook, Jesse Griffiths has created a book that not only highlights the glories of Texas' abundant game and fish, but is also just as relevant and as useful wherever you can find doves and deer, crabs and crappies. It is one of a very few modern cookbooks that does justice to America's wild game and fish." "Jesse Griffiths practices what most of us only preach when it comes to sustainable eating. Afield shows us that hunting is as much about compassion, respect and knowledge of animals, and the land as it is about the preparation. Much praise goes to Jesse for making the art of hunting and cooking game approachable." "From his love of hunting and fishing, Jesse Griffiths has created a rare and beautiful book." Advance Praise "Of all the members of The Butcher's Guild, Jesse is one of the most intrepid and iconoclastic. Gracefully teaching sustainability and holistic cooking in Texas, he has become the young grandaddy to a new generation of chefs and butchers. His prose and approach are as warm as a campfire on a Texas dove-hunt." "The recipes are spot-on (I cook; my son is a chef), the photography is gorgeous, and the philosophy is a welcome breath of non-self-righteous rationalization." "This book is inspiring. Jesse captures the energy of the hunter gatherer in a refined and approachable way. This book makes me want to eat Snipe and smoke my own catfish." "Jesse Griffiths knows what's important about food...that it's fresh, local and allowed to speak for itself. He's an old school chef with deep respect for the land, his farmers and purveyors and the food they produce and it shows through his cooking." "For all who want to take increased responsibility for meat eating and plan to hunt it themselves, Afield is the book to follow. For all who may aspire to hunting, it is the book to read closely for a real sense of the experience. 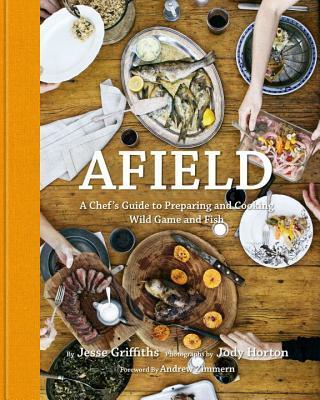 For those who already know the pleasures of the hunt, but may not know how to maximize the pleasures of the table, Afield is the book to cook from." "The magic, and why I think Afield is a special work, is that it fully portrays a way of living and thinking that allows us to return to a more simple way to be measured and respected. And it does so without lecturing or pandering. It reminds me that by living a more principled life, I can make my world a better place and I can use food and cooking to do it. This book is a beautiful piece of work, and after you read it, and cook from it, please get outside and get dirty with it. Wherever you are, the great outdoors is waiting for you, afield." "It's not news that we're rethinking how we eat. Between money issues, and the conglomeration of differing ideas about where we should get our food and what we should do with it, I'm surprised we've not seen a book like Afield before now. Then again we've not had a Jesse Griffiths stepping forward before now. With this book he reaches beyond those who have always hunted. He lives that idea of working with what is around you and hunting naturally comes out of that for him. Hunting is not for all of us, but this book has much to teach about working with meat, cooking game well, and for some us, it offers a gentle, thoughtful introduction to a way with food that seemed foreign in the past. It could be a marker for the future." "If things get tough on Planet Earth, you'll want Jesse Griffiths at your side, or at least, his educational and entertaining book, Afield! Read Jesse Griffiths' Afield for inspiration, and then get out to the wilderness and bring home a wild hog, or at least a few fish! Then flip through the pages of this beautiful book to learn what to do with your catch. Jesse Griffiths is an omnivore's inspiration — one of Texas' greatest supporters of and educators on local foods of every kind — he's just as good with vegetables as he is with game. Afield is Jesse Griffiths and his cohorts at their finest. If you don't have a gun or a fishing pole, just delve into Afield for a great armchair experience!" "For a reader who knows the magic of a duck blind at sunrise, the writing is evocative; for the novice, it offers additional insight into why hunting and fishing are favored pastimes for millions in this country." "Griffiths forges a new approach to the sustainable movement through a compelling narrative on the benefits, both mental and physical, to catching your own dinner."